A property of many natural textures is that they retain their geometric character at various levels of magnification. Thus, a piece of the object is similar to the whole object. 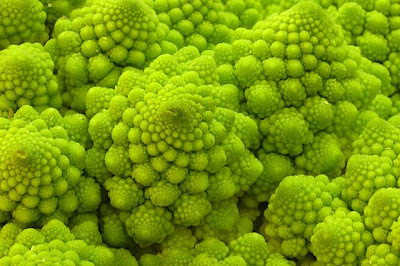 For example, in this photograph, a little piece of Romanesco broccoli has the same “spiral-knobby” character as the whole broccoli. Self-similarity is a property of fractal geometry, which has taken great leaps in the computer graphics arena. We recognize the forms of this “mystery cave” as being natural, even if we’ve never seen them before. (Video Link) In this video, the principle is played out in mechanical looking forms. The camera can fly in and out of the forms, finding ever more intricate shapes, worlds within worlds. In another video (link to video) using some of the same “Mandelbulb” software, the forms are more organic, but still self-similar. These tools suggest interesting possibilities for generating bizarre and convincing landscapes that would be fun to explore in games and films. Here’s where the image of the “Mystery Cave” came from. The link takes you to a good technical explanation of the software and its potential. Below, the classic text on fractal geometry by one of its founders, Benoit Mandelbrot. A bit behind the times I see. As a matter of fact, several games have procedurally generated and fractal-based landscapes. Polynomial is a space shooter with fractal-generated landscapes, and Minecraft, Spelunky, and Audiosurf all base their landscapes on very simple algorithms that create large and consistent worlds. Fisher-Diver on Kongregate uses procedurally generated NPCs, as do many other web and XBox Live Arcade games. 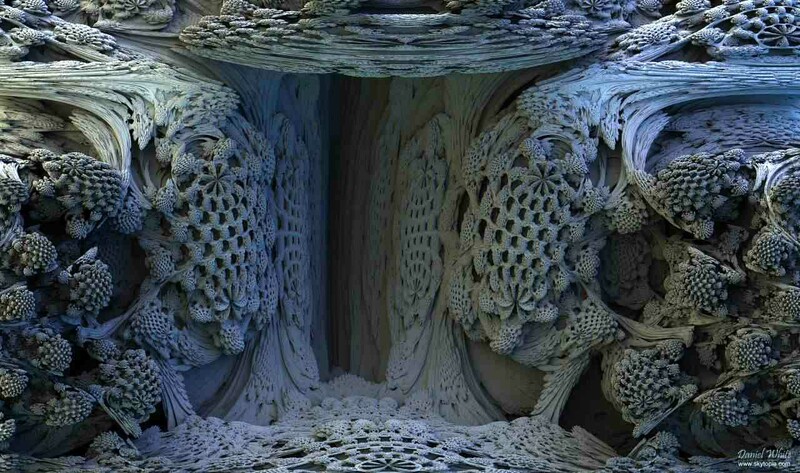 Fractal Landscapes specifically are a well-explored but relatively unsuccessful concept. I think that when technology progresses this would be a pretty effective way to create convincing textures in video games. Folarx, yes, these forms seem a perfect match to a Lovecraft universe. Jude, of course computer graphics based on fractals go back quite a long time -- way more than a decade -- and have been used in various ways in VFX and games. But I'm sure they will be used in many ways that have not yet been imagined. Cool post! I've seen the fractal broccoli before, but not the cave nor the 3d generated fractal textures. PBS did a little documentary about fractals titled "Hunting the Hidden Dimension". They mentioned several examples of fractals in everyday stuff. Cell phone antennas, snowflakes, trees, lightning, and seashells are all fractals. I know this is not related to the post, but I went to your workshop at LAAFA recently and you mentioned a great quote from Norman Rockwell....about painting compared to throwing a ball against the wall, and coming back with less force. Would you be able to tell me where to find that quote? I'd like to share it with my students at CSUF. Thank you for your incredible generosity in sharing your knowledge with us. Your books are my class textbooks. Hala, the quote comes from his instructional piece for the Famous Artist Course, republished as "Rockwell on Rockwell": "Putting across a picture idea is something like bouncing a rubber ball against a wll. No matter how hard you hurl the ball, it returns to you with less speed than you threw it. It is like that in telling a story in a picture. You must feel love or hate or humor much more intensely than you can expect the people who see your pictures to receive the impression."